Fresh cheese. Organic greens. Homegrown milk. Juicy apples. All in a day's work for Connecticut's $2 billion agriculture industry. And all on display this past week at the State Capitol as part of the annual Agriculture Day festivities. The main floor of the Capitol was transformed on Thursday into a complex of diverse displays of "Connecticut Grown" agriculture hailing from its many municipalities. It was, suffice it to say, a popular place to be, as Capitol workers, nearby state employees, browsers and high schoolers crammed into the exhibition area. And, yes, nearly all the displays featured plenty of free samples of homegrown goodies from Connecticut farms, orchards and gardens. As F. Philip Prelli, the state's agriculture commissioner, quipped, "If anyone goes home hungry today, it's their own fault." Through it all - the festive atmosphere, eager participants with samples in hand, brochures aplenty - one message came through loud and clear: Connecticut's agricultural industry is still alive and well, and still very important to this state. Sure, Connecticut's known as the wealthiest state in the nation, and Fairfield County is basically a bedroom community to New York City's financial district. But between its cities and suburbs there are still farms to be found, orchards to tend to, greenhouses to cultivate and gardens to grow. • Thousands of acres of open space. • $2 billion in annual economic output. • More than 120 farmers markets in 97 towns. This state is rich in agricultural history: The first farmers market was established in Hartford in 1643; the oldest country fair in Connecticut is the Brooklyn fair, which began to entertain young and old alike in 1809; and the first commercial peach orchard in the country was the J.H. Hale Orchard, started in Glastonbury in 1875. 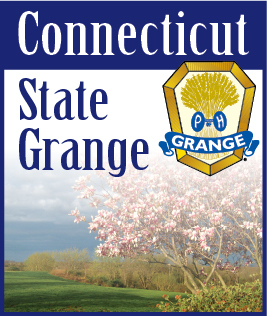 Here in eastern Connecticut, there are still plenty of working farms - some among the oldest in the state - and there are greenhouses, orchards, Christmas tree farms, beekeepers, cider mills, and juice makers. Rell said that as the state celebrates its 375th birthday, it was only appropriate to say a special thank you to the farmers and other agricultural producers who toil daily to make products that we eat, drink or cultivate. During her remarks to the large gathering assembled for Ag Day, Rell tied the state's big birthday to its agricultural roots. "The motto for our yearlong celebration is 'Industrious, Inventive and Enduring,' " said Rell. "To me, that sums up the spirit of Connecticut farming."